Go covert the next time you pack your lunch from home – with the Swiss Advance Retractable Fork and Knife that will certainly bring out the James Bond in you. Never mind about your plastic picnicware that you are used to love to loathe, and neither do you need to tote around clunky metal cutlery. Swiss Advance, masters of the compact tool market, has just released their Swiss Advance Retractable Fork and Knife. Being self-explanatory, they are made out of a combination of stainless steel and plastic, which means they are not only light, but tough and ought to be good servants for years to come. Perfect when it comes to outdoor events like picnics and camping, they’re a snap to stash away once you’re done eating – leaving you to wash them only when you’ve arrived back home. 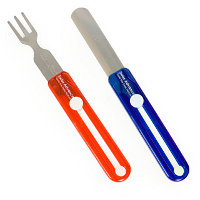 You can choose from red or blue sets, where individual utensils (replacements, most probably) will retail for £7.99 while a pair is slightly cheaper at £14.99.